The halogen bulb ban has come into force this month to help people save energy and reduce carbon emissions. Across Europe, the move will encourage households and businesses to choose energy-saving LEDs to replace halogen bulbs. The change is a great opportunity for people to take advantage of the massive energy savings that LED delivers, as well as smart lighting innovations that give them greater control. The inefficient halogen bulbs are finally being removed from the market as part of an EU drive to reduce energy consumption and lower the impact on the environment by cutting carbon emissions. This is the final part of the EU directive that from 2009 has progressively curtailed the production or import of all forms of incandescent light bulbs. First to go were the standard incandescent bulbs, followed by halogen GU10 spotlights in 2006. Non-directional general lighting and candle halogen bulbs were temporarily reprieved until September 1st to allow LED manufacturers to develop cost-effective halogen bulb equivalents, particularly the brighter ranges. The move to LED lighting ensures that people will make big savings on their energy costs when they replace their halogen bulbs. LED bulbs consume up to 90 per cent less electricity than halogen models and last far longer. Households would need to replace halogens bulbs – with typical use of three hours daily – every two years. A well-made LED bulb will last for up to 30 years. With average use, an LED bulb will save enough energy in around a year to repay purchase costs and then go on saving on electricity bills for decades. According to global manufacturer Philips, replacing 10 halogens with 10 LEDs would deliver long-term savings equal to about £112 a year. The EU move is an element in the wider Ecodesign project to improve the energy efficiency of a range of products, from washing machines and vacuum cleaners to lighting and other domestic appliances. It is expected that the halogen bulb ban will save up to 93 teraWatts each year (TWh/a) by 2020 across Europe, which is the amount of energy consumed annually in Portugal. The EU also predicts that the move to halogen bulb equivalents will save 15.2 million tonnes of CO2 emissions by 2025. Halogen bulbs are really a form of “old technology”, with very limited scope for innovation. The bulbs are basically wires heated by energy in a gas. What makes LED lighting so promising is that the microchip technology provides the base for continual innovation and improvement. The LED bulb is a modern marvel of engineering and the chip at its heart means that it can be adapted for a variety of uses. For example, an LED smart bulb provides the ability to wirelessly connect to networks and allow remote control by phone app. Smart LED lighting can be customised remotely and fully managed with intuitive mobile controls. It is seen as a crucial element of home automation built around the Internet of Things (IoT), giving people the ability to finely manage different aspects of their lighting. LED technology also provides simple but brilliant innovations like Philips SceneSwitch that gives people the power to choose from three lighting moods at the touch of the switch, with no need for other controls. What do I replace halogen bulbs with? The cap types affected by the final halogen bulb ban are those that are most commonly used in UK households. They include the standard fitting E27 edison screw (ES) or B22 bayonet bulbs (BC) and the smaller E14 (SES) and B15 (SBC). You can choose from our extensive range here. They join those banned earlier, including the directional spotlight models, like the “twist-and-lock” GU10, and the push-fit MR16 (GU5.3) as well as the MR11 (GU4). More details and options are here. One point worth considering is to get advice if you run your halogen bulbs through a transformer, for example in your kitchen. The low voltage of some LEDs can “confuse” the transformer and result in flickering so it’s good to check. You can call our expert team on 0333 123 5464 for advice. 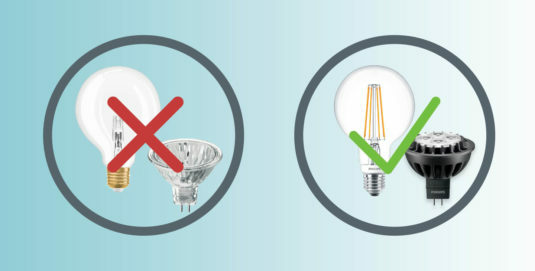 In terms of brightness, a 40W halogen bulb can be replaced by a 4W LED – for example the Osram LED Parathom Retrofit Classic P Bulb while a 60W halogen is easily replaced by an 7W LED like the Philips Large LED Filament Bulb. What about quality of light? The choice of “temperature” is also important with many people seeking to replicate the quality of light given off by the halogen bulb. Early LED bulbs were criticised for having a bluish, harsh light compared to traditional bulbs but this soon changed as manufacturers developed different colour temperature LED bulbs. Colour temperature is measured in Kelvins (K). To replicate the warm light you might be used to from halogen bulbs, choose a “warm white” (2700K). For the kitchen or bathroom, a slightly “brighter” bulb that provides “natural white” (3000K) is often suitable while a “cool white” (4000K) is another option. Currently, there are a narrow range of specialist halogens that have not been banned as energy-efficient options are either not viable or available. These include some G4, G9 and R7 capsule bulbs used in some ovens and cooker hoods. We have energy-saving G4 capsules available – check here. Ready to change for the better? Call us for expert product advice!